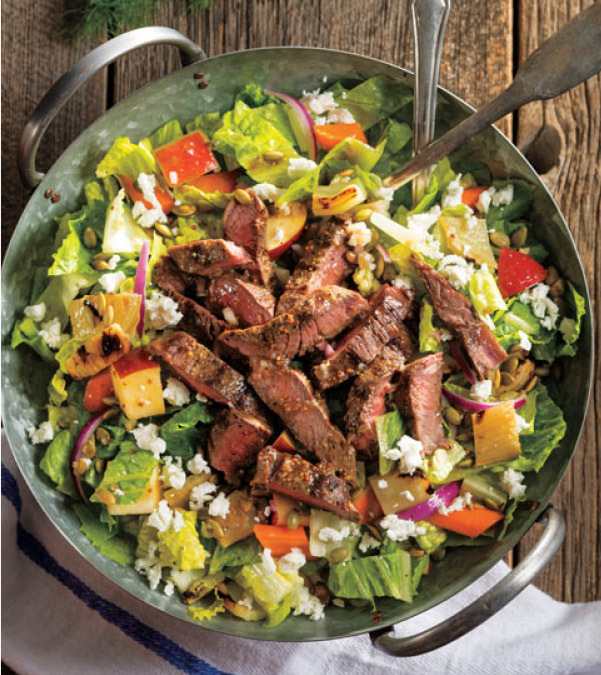 2.Prepare Steak Harvest Salad: In small bowl, combine salt, pepper and garlic powder. Rub steak and fennel with oil; sprinkle with salt mixture. Place steak and fennel on hot grill rack; cover and cook steak 10 minutes or until internal temperature reaches 140° for medium-rare, turning once halfway through cooking; cook fennel 4 minutes or until lightly charred and crisp-tender, turning once halfway through cooking. 3.Transfer steak and fennel to cutting board; loosely tent steak with aluminum foil and let stand 10 minutes. (Internal temperature will rise 5 to 10° upon standing.) Cut fennel into 3/4-inch pieces; discard core. Cut steak into 1/2-inch-thick slices.